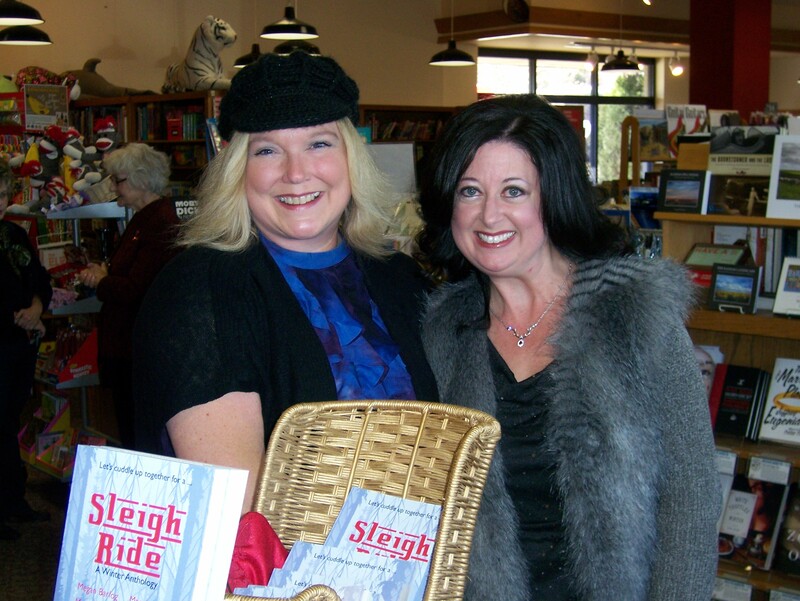 Sleigh Ride, Flash Mob and a Victory Shot! Earlier this year I found out my short story, “No Place Like Home” would be included in the winter anthology, Sleigh Ride. The book is a compilation of stories from 7 authors including 4 previously published and 3 newbies. It was the brainchild of friend and author, Malena Lott and the debut book for her indie publishing site, Buzz Books, USA. I wrote the story, agonized over the editing process, kissed it, and sent it on its way. A few short weeks ago I found out our local bookstore, Watermark Books, had agreed to buy 50 copies AND they wanted to have an official book signing. WHAT? When I found out, I was stunned, excited and immediately wondered how I was going to lose 20 pounds in 3 weeks. Then I ate my weight in sugar wafers trying to sort through my feelings about the whole thing. Pssst, I didn’t lose those 20 pounds. Shocking, I know. Two days before the book signing I obsessed about everything from my hair color to my outfit. I was a mess. Thank the good Lord for sweet Rachel at Dillards. She was there for me during my 9th hour of shopping and gave me the Pretty Woman moment I’d been craving. She’s a recent transplant from New Jersey. I hope she loves Kansas because now she must always be here for me in times of fashion crisis. 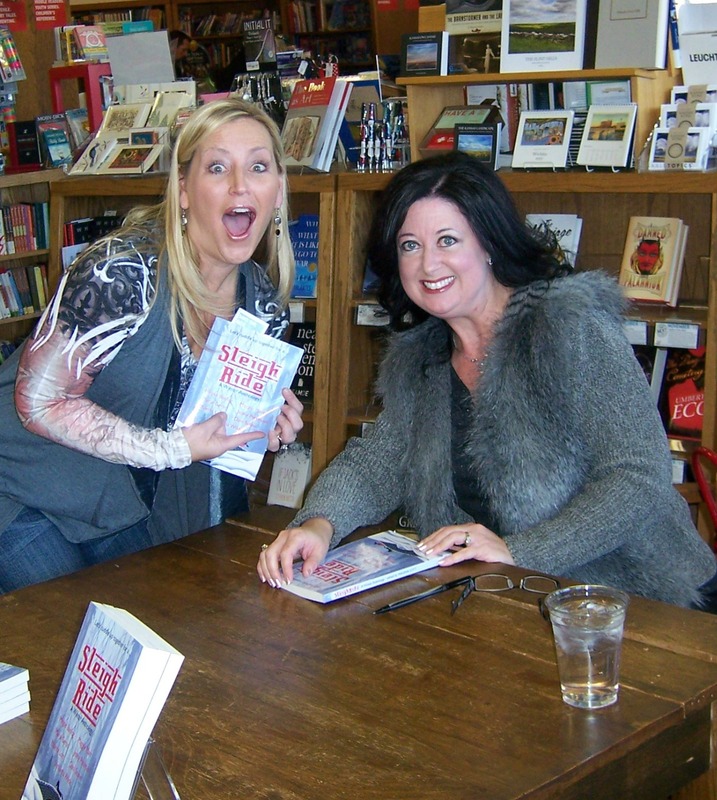 Irony: For those of you who have already read the story, yes, it was completely accidental that I chose a grey faux fur to wear at my signing. For those who haven’t read it, you’ll have a giggle when you do. 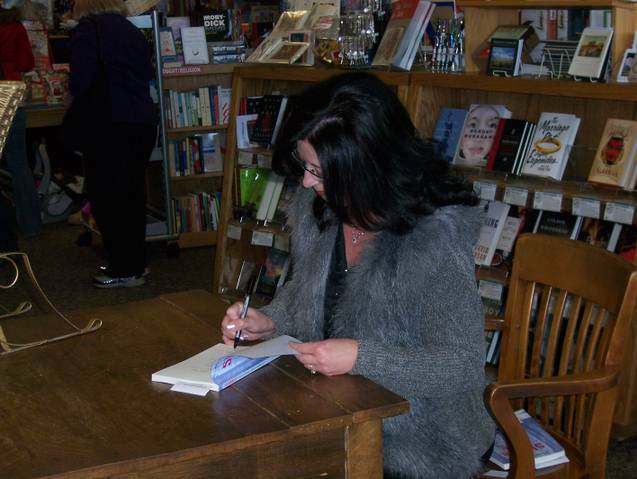 BOOK SIGNING DAY!! I walked in to the already-bustling book store 20 minutes early so I could collect myself and set up the adorable wicker sleigh my sweet and thoughtful Mama loaned me to display my goods. Within minutes I was approached by someone, and then another, and then my family started pouring in. My brother called me from the car where he waited with a shot of Tuaca (vanilla liqueur – liquid courage) but I had no time for pre-signing hooch. It was awwwn. For the next two hours I hugged and signed and laughed and posed for pictures and had a bit of an out-of-body experience. As my family filed in, they said hello and then shuffled over to the side where they lined the wall, talking and snapping pictures. They may not know till now, just how special that was for me. I was completely out of my element and even though I barely had time to make eye contact, I heard their familiar voices talking to each other, flanking me, protecting me, cheering me on. Guess what? I HAD A FLASH MOB, Y’ALL. One of the best parts of the day came when Doug arrived with the baby dolls, Jacob and Katie. Shortly after walking in the door, Doug asked, in a commanding voice, if he could HAVE EVERYONE’S ATTENTION. And he did. At least 60 people. Before I knew it, I was being serenaded with a personalized rendition of Deck The Halls. Song below. 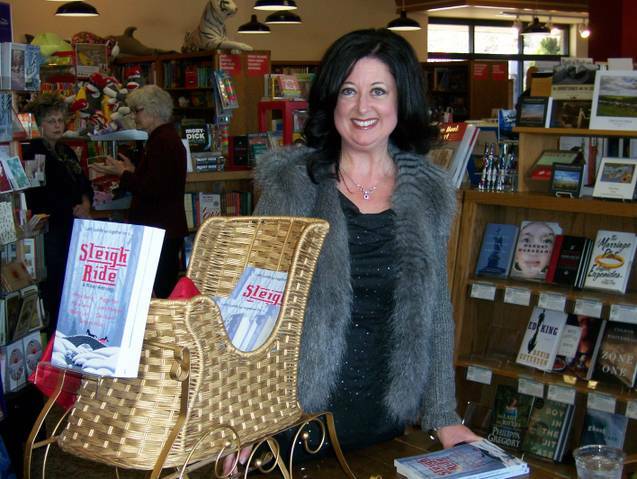 Pack the shelves with Sleigh Ride books. Paperback, hard cover and nook. Many more books she will make. Now we give her this awesome cake. Then, just as the song promised, they presented me with this cake!! Gorgeous AND delicious. Hidden in the sleigh for me to find when I got to the book signing was a card and a box of Raffaello almond/coconut candies. My all-time favorite. My husband gets me. Sure, flowers would’ve been a nice gesture but hidden candy and cake?? Perfection. I’m never leaving him. Highlight #2: My friends for 22 years, Darren and Gigi VanBuskirk, drove 6 hours roundtrip to see me for one hour. That’s love. I adore them. Gigi VanB – MPV award for driving 6 hours to be there. Highlight #3: Having my husband, kids, parents and siblings there. Since I was wearing more eye makeup than a drag queen, I had a firm, “no tears till 4:00” rule but when I looked over and saw my favorite people, I nearly lost it. 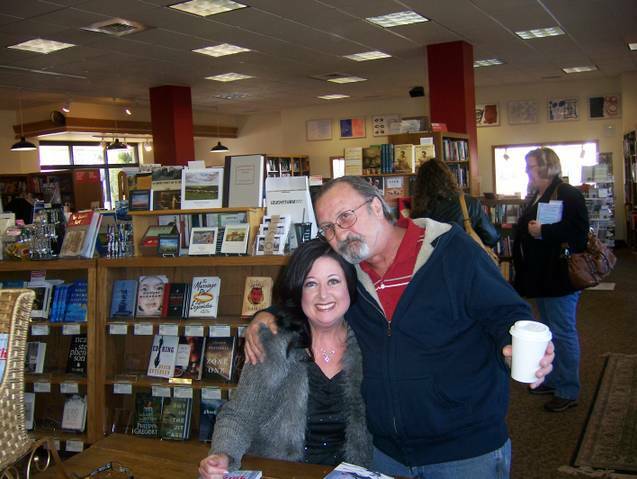 Highlight #4: Most people who purchased books were family, friends, Twitter pals, friends of friends, etc. BUT, there was a perfect stranger who made my day, BETTY!. She was in her mid-60s, I’m guessing, with a short crop of maroon hair. It was lovely but clearly the color was purchased and not God-given. Betty approached the table and with great excitement asked me to sign her book because, “I’ve never met an author in real life or had a book signed. This is a treat.” Ohhhh, Betty, you precious thing, trust me. The treat was all mine. Highlight #5: My good friend, Andrea Anglin, rushed over from a birthday party and brought her children, Elizabeth and Joe. Elizabeth had me sign her autograph book and announced, “you’re my first author.” My mother overheard and got misty-eyed. I bet she’s misty again reading this. It’s okay, Mom. There. There. No “best wishes” or “love ya” from me. I signed quality content. 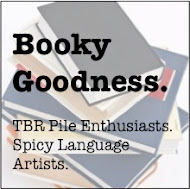 Highlight #7: My Book Club Hotties. They’ve encouraged me for over a year. They were there when best-selling author, Beth Hoffman, said, “Don’t give up on your dreams or yourselves.” I adore each of them. I’m still walking on air. Still feeling like a bride on her wedding day. Still remembering what a surreal day it was and secretly, looking forward to the next one. To those of you who shared the day with me, THANK YOU. You will never know what your presence in those 2 hours meant to me. I wish I could kiss every single one of you but it’s cold and flu season so accept this heartfelt *wave* instead. To those of you who made it to the end of this VERY long indulgent post, thank you too. 🙂 Your sacrifice was just as great. If you read the story and enjoyed it, we’d love to see your review on Amazon and Barnes and Noble! If you haven’t purchased a copy of Sleigh Ride yet and now after reading this post you’re all excited to see what the fuss is about, here are some links where you can purchase the trade paperback and e-book. Don’t forget, a portion of the proceeds benefits the national domestic abuse prevention fund via Alpha Chi Omega foundation. Categories: Blog, Sleigh Ride Anthology, Uncategorized | Tags: book, christmas, deck the halls, dillards, girlfriends, Malena Lott, sleigh ride, tuaca, watermark books | Permalink. I would have crawled on broken glass to be there, friend. You complete me. *whisper* book signing is hard! love you! I LOVES ME SOME DANI BLOG! Congratulations Dannie!!! It is good to accomplish the dreams and goals in life, it is just wonderful…God bless you!! You know you are a doll and a half. Your hair and outfit look amazing and I wish I could’ve been there in person, but hurrah for such an incredible event! Oh my gosh, I actually wept (and laughed) as I read this. What a remarkable day for you, a day that you’ll surely cherish forever. I only wish I could have been there to give you a hug in person! But I’ve done the next best thing … I’ve purchased SLEIGH RIDE and tonight is the night I plan to begin reading! 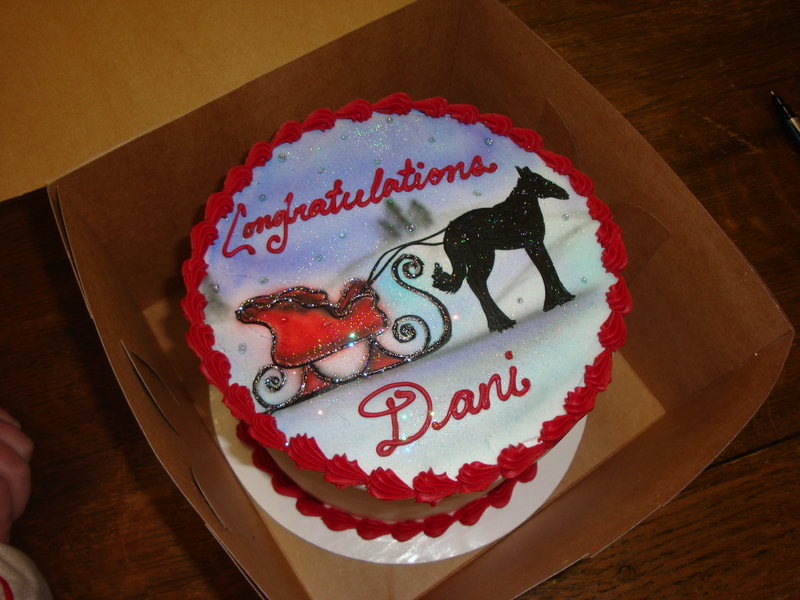 So thrilled for you, Dani. And thanks so much for the sweet shout-out.